Dr. Rebecca Hobbs works with local sleep physicians in the Augusta area to provide oral appliance therapy for patients with chronic snoring and sleep apnea disorders. We all snore on occasion, typically when we are sick or after a heavy meal. Frequent, loud snoring however may be a sign of sleep apnea. If the patient has symptoms of a sleep breathing disorder, Dr. Hobbs will make a referral to a local sleep physician for diagnosis and treatment planning. Dr. Hobbs performs a sleep apnea screening as part of a routine medical history review and dental examination. The facial muscles and soft tissues in the mouth and back of the throat are very relaxed while we sleep. Snoring occurs when these tissues partially obstruct the airway; the relaxed tissue becomes loose and vibrates while breathing to produce a snoring sound through the nasal passages and mouth. 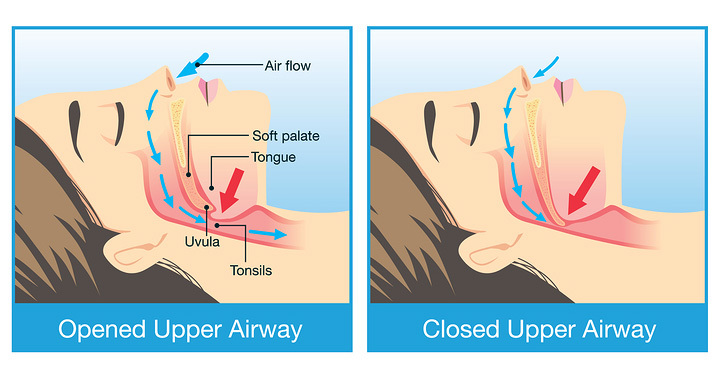 For sleep apnea patients, the airway can become fully blocked, causing the patient to stop breathing altogether. An observer would hear the patient snoring loudly, followed by a brief silence as breathing stops. The patient then gasps for air as the brain wakes up to tell the body to breathe. It is not unusual for a patient with severe sleep apnea to stop breathing multiple times while sleeping. Sleep apnea is diagnosed through testing by a sleep physician. The most common treatment for sleep apnea is CPAP therapy (continuous positive airway pressure). CPAP utilizes a mask device that the patient wears during sleep; the mask is attached to a machine that produces air with enough pressure to keep the airway open and maintain continual breathing. Some patients find the CPAP mask and hose connections overwhelming; another common conflict is sinus or respiratory issues that make CPAP intolerable. As an alternative to CPAP, dentists trained in sleep apnea management may provide oral appliance therapy to support the airway under the direction of a sleep physician. The oral appliance is similar to a nightguard; it is designed to push the lower jaw forward to help prevent the soft tissue from blocking the airway. Sleep is invaluable to the body's systems. Our organs depend on restful sleep to support cell growth, and the heart and circulatory system require sleep to relax and heal. Lack of quality sleep is related to a long list of medical problems, including morning headaches, anxiety and depression, memory issues and daytime drowsiness. Reduced oxygen intake due to breathing cessation events can further complicate other medical conditions, such as high blood pressure and diabetes. If you or a loved one struggle with frequent snoring, it is important that you follow up with a health care professional for screening and additional testing as needed. Please do not hesitate to contact Hobbs Dentistry if you have questions about snoring or sleep apnea.